TNT Express is a recent spinoff from the former TNT (now called PostNL) a private mail operator in the Netherlands. In this post I'll give a small background on the company, show a comparison with competitors, and look at catalysts for improvement. The Netherlands privatized mail delivery and TNT was one of the companies that filled the void. Private mail can be thought of as two separate functions, the actual door to door mail delivery function, and parcel/freight delivery. TNT handled both functions up to May 30th of this year, at which point it demerged the post division from the express division. TNT Express is a worldwide parcel and freight delivery company. The company considers themselves an integrator which the following picture depicts. Other integrators are DHL, Fedex and UPS. TNT Express delivers packages by truck and air. I'm unclear if they use rail, but they might use it as UPS does which is load the trailers onto rail cars for long haul transit. The company operates in three main segments, Europe & MEA (Middle East, Africa), Asia-Pacific, and Americas. The company is well established in Europe & MEA, expanding in Asia, and has a growing presence in South America. It appears that they will ship a product to North America but they don't have any direct presence. As noted in the picture the Americas division is contributing a loss which is due to some execution failures in Brazil. One catalyst which will be talked about below is a turnaround in this division. I've had TNT Express in my "to research" hopper for a few months with my main struggle being how to approach the valuation. Express is a much more complex company than I usually evaluate and the company is in a market I don't know much about. I got the idea to do a competitive analysis from this blog post. In that post the author mimics a Benjamin Graham worksheet, I took a few modern liberties in creating my spreadsheet to show fields Ben Graham might not have had access to. 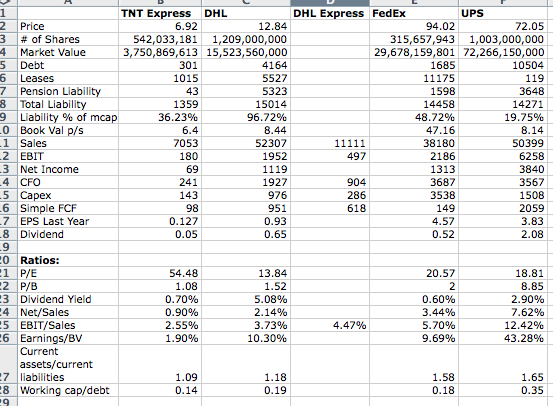 For the purposes of the spreadsheet I compared TNT Express, DHL, Fedex and UPS. All three competitors were identified by Express as competitors who have substantially similar business models. In addition while digging through DHL's annual report I was able to pull out a few income figures for their DHL Express division which I think are useful for comparison purposes. I should also note, Express and DHL figures are in Euro, Fedex and UPS in dollars. I considered converting all to Euro but deemed it unnecessary, the margin and ratio figures are currency independent and the most important. The spreadsheet is rich with data which an investor might want to use as a starting point in looking at Express, I'm not going to go over each field but wanted to highlight a few that were important. The first item is that I added in pension liabilities and operating leases to get a complete liability picture. This is important because all of the companies except for UPS operate with a high level of operating leases. Express is clearly the smallest company of the four. The P/E is quite high on a TTM basis, while the company is trading almost at P/B. Express has the lowest margins of all four. DHL's Express division is responsible for most of the profitability of DHL as a whole. This is the reverse of PostNL and TNT Express. Pre-demerger PostNL contributed a larger portion of profits but was in decline while TNT Express contributed a smaller amount towards earnings but growing at a faster rate. UPS has an eye popping Earnings/BV ratio because they include their debt on the balance sheet. Adjusting the other companies' BV to include operating leases would increase their Earnings/BV ratios as well. Looking at the raw stats on TNT Express doesn't exactly throw off a buy vibe to me. Many times a spinoff creates an opportunity where the business spun off is clearly undervalued at the onset. Other times the spinoff could hold potential if the new management is able to unlock hidden value, I believe this is the case with TNT Express. The first catalyst is a turnaround in the Brazil operations. The CEO has stated this is the highest priority and expects to be breakeven in 2012, and profitable in 2013. If this happens remains to be seen, but they appear very hopeful and motivated. I think management has the greatest incentive to turn things around now that they're standalone. While part of PostNL the losses from Brazil weren't as large compared to the profits from the company in general, whereas now as a standalone company Brazil is having a much bigger negative influence on the accounts. The second catalyst is that it appears part of the motivation to spin off Express was so they could be sold. The management of TNT stated this explicitly a few times in the business press. In addition PostNL holds a 29% stake in Express to which management has stated in they would vote yes for acquisition offers on their stake in Express. It appears the 29% is a way for PostNL to profit if an acquisition takes place. My suspicion is that a suitor approached them but only wanted the Express division not the entire company and a legal demerger was one way to satisfy this requirement. The third catalyst is that the 2010 operating income, and net income were heavily influenced negatively by spinoff items. There were €45m in demerger costs in 2010, in addition there was a €92m profit pooling loss in 2010. The profit pooling is interesting, before the spin the Express division's profits were used to offset the German post divisions losses and while this is a legal distinction that existed in 2010 and needed to be reported on the statements it won't be continuing going forward. This is why reading notes is so important, the pooling items appears as a small footnote, but results in 50% increase in operating income going forward. If we take the €45m and €92m and add those back into operating income it comes out to €317m, verses the €180m reported, quite a difference. That changes EBIT/Sales from 2.55% to 4.49% which is a much more respectable number. Fourth catalyst management has stated they plan on paying out 40% of net income as a dividend. On the spreadsheet I estimated this based on the 2010 dividend. Based on the proforma EBIT the dividend would have been 9.4 eurocents a share for a 1.37% yield at today's price. I would classify this as a very weak catalyst. From an outlook perspective management has stated that their goal is to increase revenue from €7b to €10b by 2015. Most of this increase is coming from a turnaround in Brazil, and growth in the Asia operations. I've been watching Express since the first day of the spinoff when it quickly jumped to €10 and then slowly drifted down to its current price of €6.92. While I don't think the company is a slam dunk as is, I do think there are a lot of positive catalysts which if realized could create a lot of value for Express shareholders. I haven't pulled the trigger on a position yet, but I'm strongly considering it. Even with the future uncertainties around the Brazil turnaround and Asian growth I think buying TNT Express at 1x book value is probably a pretty good deal. I'd actually like DHL to spin off their express division, from what I saw I'd love to own a piece of that! Disclosure: No positions in any stocks mentioned in this post. says 350M of extra revenue from fx benefits - why wouldnt you deduct that? 1) Currency adjustments generally wash out over time. 2) TNT Express hedges most exposure, so a gain in revenue from fx results in a hedging loss at the income level. Great post you got there. Seen from the numbers I wouldn't have many reasons to invest there. Maybe you like PostNL better. As a Dutchie, I can say that PostNL has quite some problems (unhappy personnel, liberalized mail operator market-> margin pressure) but it looks undervalued(low price (P/E,B etc.) ratios, nice return ratios(ROE, etc)). If you have thoughts on PostNL I would be happy to talk about it. I can help you with understanding the (Dutch) mail operator market if you like. Ow and by the way, I was last year in Shanghai at TNT's China office. A-MA-ZING. The growth they achieve is stellar, their working culture is unlike any standard Chinese company and it's MD is a real transformational leader, a very inspiring guy. Therefore, I believe that you are right on what growth they can still achieve in Asia and in Latin America. Thanks for the comments and the insight about the Chinese operations. I agree that on first glance none of the metrics make Express stand out on a very cheap basis. I think the opportunity lies in the depressed operating income, a turnaround, and growth in Asia/Latin America.